Maca (Peruvian ginseng) is a root vegetable in the same plant family as turnips, radishes and broccoli. For centuries, it has been used as both food and medicine in South America. Incan warriors would consume maca before long journeys and battles to enhance their strength and endurance. Today, athletes are confirming what history has revealed about this incredible superfood. As an energy booster, maca is celebrated for providing stamina and mental clarity. 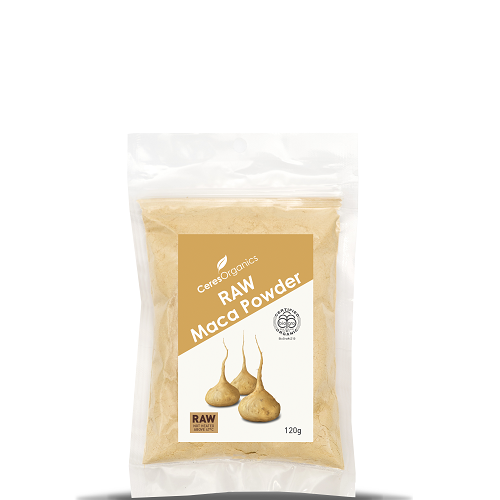 RAW Maca Powder is derived from certified organic maca roots (Pervian ginseng), used for centuries for nourishment and healing. They’re gently dried at temperatures below 47°C then milled into this fine powder, so all the natural goodness is preserved. Add to smoothies, cereal or baking for a boost of nutrition.